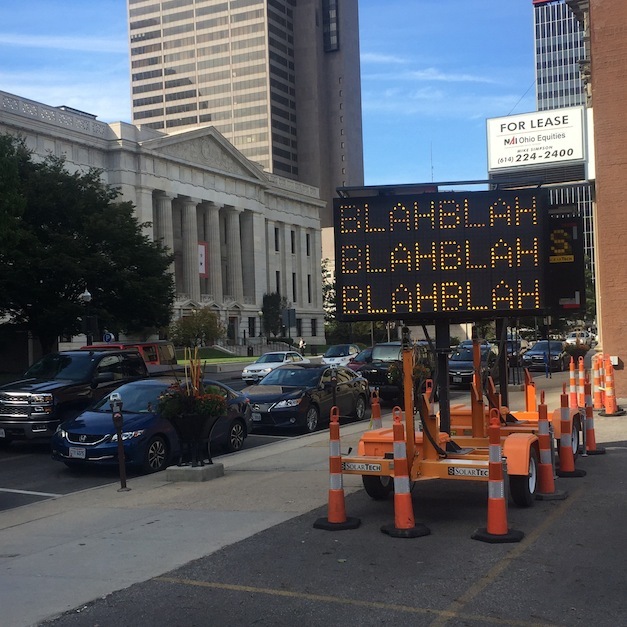 Columbus Museum of Art Curator of Contemporary Art Tyler Cann talks about Artist Mel Bochner’s BLAHBLAHBLAH sculpture, which forms part of the I-71 Project, a public art project in Ohio on the language of politics. Art by artists Mel Bochner, Ryan McGinness, Lisa Anne Auerbach, Glenn Ligon and Kay Rosen is presented on billboards and other road signage that both mimics and critiques the theater of red-versus-blue politics during the U.S. presidential campaign. The I-71-Project is a collaboration between the Columbus Museum of Art in Columbus, Ohio and the Contemporary Arts Center Cincinnati (CAC), and artist and independent curator Anne Thompson. Mel Bochner’s temporary sculpture, an LED road sign flashing BLAH BLAH BLAH in the heart of downtown Columbus at Third and State streets near the Ohio Statehouse, as well as, the entrance plaza of Columbus Museum of Art, is a wry commentary on the state of public discourse and our capacity to listen. We tend to use the phrase “blah, blah, blah” to dismiss the statements of people we disagree with. It signals exhaustion with the general noise of every day life, a condition familiar during a Presidential election campaign, and particularly to Ohioans living in a swing state. But who is saying “blah, blah, blah,” and who is dismissing it? We’ve all been in one position or the other. Whether this phrase points to politicians, the media, corporations, the public— or indeed, art itself — remains open to each viewer’s perspective. Also look for Ryan McGinness’s Re-elect Skull & Bones, which appears on a dramatic panoramic billboard (21 x 60 feet) on I-71 North, halfway between Cincinnati and Columbus. You can find the sign about three miles south of exit 45 for Waynesville/Wilmington (GPS 39.4557, -83.9952). Styled as a political ad, the work displays a symbol associated with tombstones, poison, pirates, and a Yale secret society whose former members include U.S. politicians of both parties. Complex and compelling in its many possible meanings, Re-elect Skull & Bones urges rebellion and interrogates our democracy as a closed circle. Re-elect Skull & Bones campaign buttons and bumper stickers­ are available in both museums. During the run-up to Election Day, a variety of billboard-based artworks will appear in stages in the downtown areas of Cincinnati and Columbus and along the I-71 Interstate corridor that connects the two cities. Additional work includes Glenn Ligon’s renditions of the word “America” into neon signs that wrestle with the political connotations of black and white; Lisa Anne Auerbach’s translation of political slogans from historical American elections into patterns emblazoning knit sweaters on billboards; and Kay Rosen’s BLURRED, an iconic image that embodies the project’s playful critique of partisanship and polarization. Next Next post: CMA Photo Hunt Challenges are Back!